The transport department is the fourth largest revenue contributor to the government’s treasury after commercial taxes, stamps and registration and excise. BENGALURU: You may be cursing under your breath as you struggle to inch ahead on the city’s congested roads, but the Transport Department is laughing all the way to the bank. Statistics show the department collected a whopping Rs 5,954 crore across the state during 2017-18, the highest ever in its history. The collection was 7% more than the annual target of Rs 5,561.6 crore. In 2016-17, the department had racked up Rs 5,262.4 crore against the target of Rs 5,026 crore. The department has usually exceeded the annual revenue target in the past nine years except in 2013-14 when it collected 97% (Rs 3,671 crore) of the targeted Rs 3,783.7 crore. Its revenue collection has shot up by a staggering 215% since 2009-10, when it stood at Rs 1,892 crore. The number of vehicle in the state during this period has grown from 90.4 lakh to 1.9 crore. 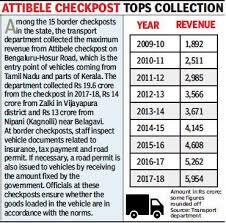 Road tax, registration fee for new vehicles, permit fee, pending taxes and fines, driving licence fee and inspection fee at checkposts are the revenue sources. Karnataka levies levies the highest road tax in India. A majority of the department’s revenue is from Bengaluru, home to 76 lakh vehicles. The transport department is the fourth largest revenue contributor to the government’s treasury after commercial taxes, stamps and registration and excise. Hence, the government is unlikely to put a cap on registration of new vehicles. In June, transport minister DC Thammanna had said they’re working on a proposal that mandates proof of parking space before buying a car and mulling restrictions like limiting the number of diesel car registrations a year to reduce traffic congestion in the city. However, department official said the government is unlikely to take such decisions as it would affect revenue. With half of the sanctioned posts lying vacant, regional transport offices (RTOs) across the state are facing severe staff shortage. Though the number of vehicles and the department’s revenue have increased over the years, the government seems to be in no mood to appoint more staff. As on March 31, 1,259 (45%) of the 2,806 sanctioned posts were vacant. The posts include deputy commissioners for transport and senior RTOs (11), road transport officers (19), assistant RTOs (58), senior motor vehicle inspectors (76), motor vehicle inspectors (298) and other office staff.